Fans of DC Comics will have more to look forward to than the animated Batman & Harley Quinn movie, now that an accompanying comic series has been revealed. 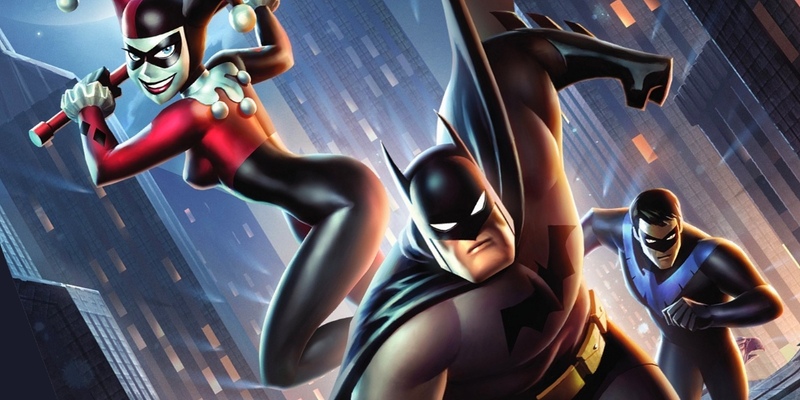 The early film trailers of Batman, Nightwing, and Harley teaming up to save the world showed that the odd extension of Batman: The Animated Series was worth fans' attention, but it's only the middle chapter of a much larger, even more promising story coming from DC and Warner Bros. Home Entertainment. We're pleased to offer the first exclusive details of the new comic book series HARLEY QUINN AND BATMAN, a prequel telling the tale of how our title characters wound up in the spot where the movie begins. Harley Quinn may be pulled out of prison to help the Dark Knight bring down Poison Ivy, but before that, fans will need to see what got her locked up to begin with. And to make the Digital First series every bit as promising as the film, some of the most proven talent in the extended world of Batman: The Animated Series has been recruited. The return to the world of B:TAS is guaranteed to please older fans, but from the sounds of HARLEY QUINN AND BATMAN's premise, current readers fonder of an independent, de-Joker-ed Harley should also be on board. Harley Quinn is a big enough movie star on her own these days, so a bit of criminal ambition should pave the way nicely for the Clown Princess to become a pseudo-partner to Batman himself. "Batman and Harley, Joker and Ivy, Nightwing and Catwoman. Is there a better cast of characters anywhere in fiction?" says Templeton. “I spent some of the best years of my career working with these icons and could not be happier to be returning to Gotham City and their adventures. And to top it off, I get to work with the incomparable Rick Burchett again! Pinch me, I'm dreaming. We're getting the band back together!" "I spent quite a few years working with these characters in this art style," says Burchett. "It’s like visiting old friends. For me, though, the best part is having the opportunity to work with Ty Templeton again. It’s been way too long." The HARLEY QUINN AND BATMAN prequel series will begin its run on Monday, July 31st, with the five chapters being released biweekly. In even better news, once the animated Batman & Harley Quinn movie arrives on August 15th the comic series will undergo an "extra-crazy" change of pace to match the story. Starting in October, the prequel series will shift to a seven-part sequel with chapters releasing digitally each week. Taking the name of BATMAN AND HARLEY QUINN to match the film, this collection of stories will call on the talents of Jeff Parker, Craig Rousseau, Luciano Vecchio, Amanda Deibert, David Hahn, Dario Brizuela, Matthew Dow Smith, Sandy Jarrell, Ty Templeton and more. The film's co-writer Bruce Timm has promised something unexpected from this take on the characters - even beyond The Big Bang Theory's Melissa Rauch voicing Harley Quinn for the first time. If the prequel series is going to take a similarly updated tone in the hands of some of the best to write and draw them, it's even more intriguing a pitch. Here's hoping this reunion of Batman, Nightwing and Harley is as much fun as the fans hope... in which case, seven stories spinning out of the movie may not be enough. All 12 chapters of the series will be collected in trade paperback in Summer 2018. But for those eager to read along as they're released, digital chapters will be available for download beginning July 31st via the DC Comics App, readdcentertainment.com, iBooks, comiXology.com, Google Play, Kindle Store and Nook Store. Batman and Harley Quinn will debut in select theaters on August 14, before arriving on DVD and Blu-Ray on August 15.